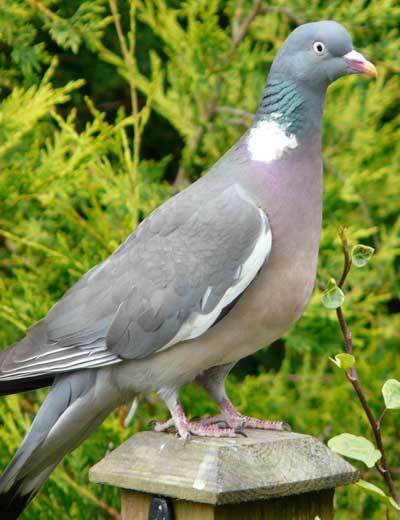 “Pigeons are thought to be the most populous bird on the planet, and come in various shapes and sizes. The ones we see most of at Warriston are wood pigeons (Columba Palumbus), which have increased greatly in numbers in recent years. They are the largest British pigeons, larger than their ubiquitous cousins the 'feral' or 'urban' pigeon (Columba Livia—often referred to affectionately as 'winged rats'). As well as their size, wood pigeons can be differentiated by their pinkish breast feathers and a white patch on the side of their necks. Despite their attractive appearance, wood pigeons can be extremely destructive on the plot, arriving in pairs or even small flocks, particularly early in the morning, where they feed on your crops: their favourites are the brassica family, so any cabbages, cauliflowers or kale left exposed are fair game. You'll know when you've been a victim of pigeons as leaves will be pecked and torn apart, leaving only the spines. Healthy plants often bounce back from one attack, but repeated attacks will result in small yields, and plants often 'bolt' before they are mature. Pigeon defence measures at Warriston. Net your brassicas—and keep your netting taut all round to avoid trapping smaller bird species.